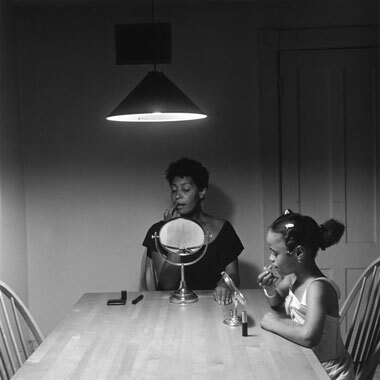 Carrie Mae Weems, "Untitled (Woman and daughter with makeup)" (from the "Kitchen Table Series"), 1990. © Carrie Mae Weems. Courtesy of the artist and Jack Shainman Gallery, New York. The Galleries at Herron School of Art and Design is pleased to announce three exceptional public talks during the spring 2018 semester with art critic Lori Waxman, furniture maker Tom Loeser, and internationally renowned artist Carrie Mae Weems. Each year, artists, designers, and other cultural producers are invited to speak at Herron School of Art and Design on timely issues related to contemporary art and culture. This spring, the talks will explore the role of the contemporary art critic, one furniture designer’s irreverent challenge to tradition and expectations, and an artist’s life-long investigation of cultural identity and systems of power. Wednesday, January 10, 2018 at 5:30 p.m.
Waxman has written about contemporary art for the Chicago Tribune, Artforum, and other periodicals for the past 18 years. Her books include “Girls! Girls! Girls! in Contemporary Art” and “60 wrd/min art critic,” which was also the name of Waxman’s live performance of art criticism at dOCUMENTA (13). Waxman teaches art history at the School of the Art Institute of Chicago. Monday, March 5, 2018 at 5:30 p.m.
Loeser has been head of the wood/furniture area at University of Wisconsin–Madison since 1991. Loeser designs and builds one-of-a-kind functional and dysfunctional objects that are often carved and painted. His work is always based on the history of design and object-making as a starting point for developing new form and meaning. Wednesday, April 4, 2018 at 5:30 p.m.
One of the most important and celebrated contemporary American artists, Carrie Mae Weems has investigated issues of race, gender, and class for over thirty years. Her artwork continues to raise important questions about cultural identity and the politics of representation. Weems is the recipient of the MacArthur “Genius” grant, the Congressional Black Caucus Foundation’s Lifetime Achievement Award, and the Prix de Rome. Support for Herron’s endowed talks is made possible by Jane Fortune, Jim and Nancy Smith, and the Christel DeHaan Family Foundation. Additional support is provided by The Great Frame Up Indianapolis. All talks are free, open to the public, and held in the Basile Auditorium at Eskenazi Hall located at 735 West New York St., on the IUPUI campus. For more information, visit HerronGalleries.org.